Our school is located in the capital of Hungary, Budapest. 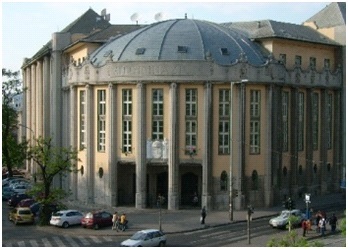 It was designed by Lechner Ödön, a famous Hungarian architect and has been used since 1915. Currently there are five different classes (A, B, D, E, F). The class A is the Hungarian-Italian bilingual class. In the class B one part of students learn English and the others learn mathematics. D is divided in 3 groups. One third of this class specialises in German, one third in art and drawing, and the rest of the class follows a regular curriculum. Class E is specialized in biology and chemistry. Class F is separated in two groups. Half of the class learns IT and the other half learns media studies. There’s possibility to learn English, Italian, German, Spanish, French and even Russian language. We have 3 main programmes every year, organised by students; the presentation show of first classes, “UNESCO shows” (each class presents the culture of another country) and the election of the student director. There’re also a lot of smaller programmes like student exchanges and foreign trips. We also have a summer camp at Lake Balaton which provides an opportunity to every student for a summer relaxation and entertainment.